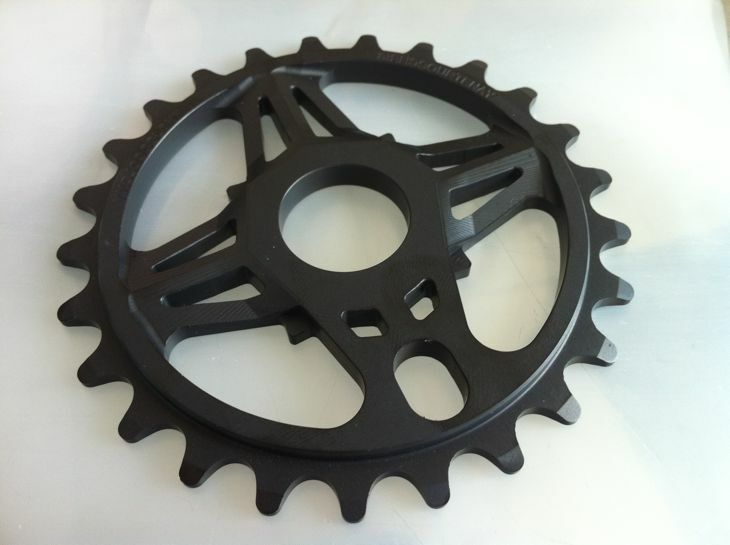 To celebrate the release of the new CC Sprocket. 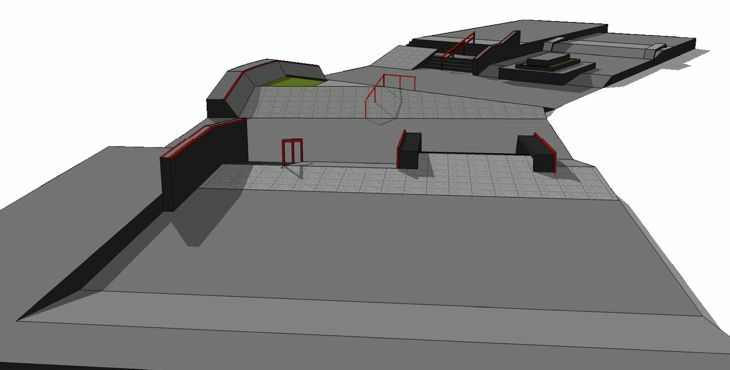 The guys at Ride On BMX have teamed up with Chris Courtenay (who works at Ride On) to bring you all a great deal… read on below for details. Chris Courtenay recently spent some time in Greenville, NC to ride & hang out after Interbike. He got together with Guettler whilst there for a day to film this ten clips instalment. Chris chose Jaycee Park as the venue & he did not disappoint. Filmed & edited by Ryan Guettler. 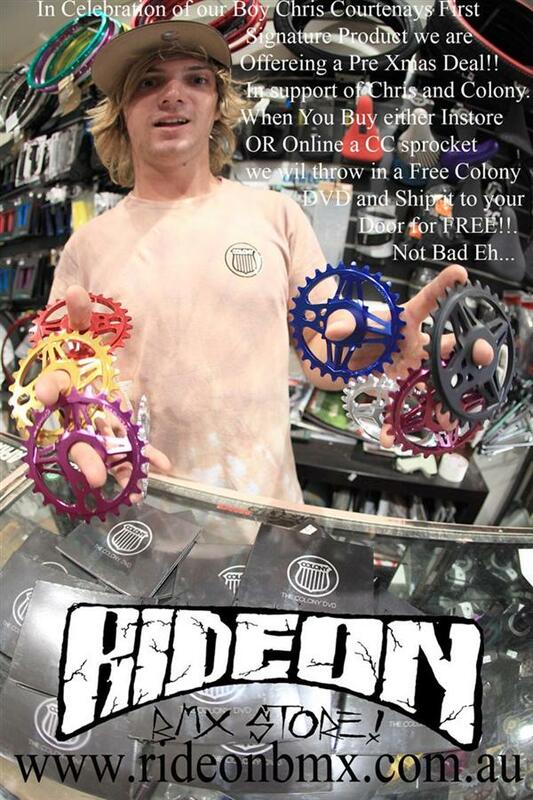 Chris Courtenay’s signature CC sprocket is now out in stores in Australia & the USA. It will be in other countries very soon as well. 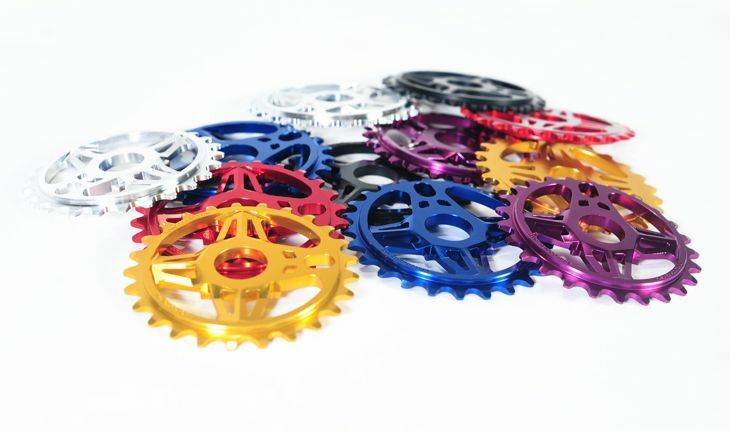 Extensively detailed & CNC machined from a solid piece of 7075T6 alloy & available in a bunch of colours. Check them out now. Been in America for 6 weeks now, still got another 2 weeks left. Greenville is going awesome, been riding everyday. Not too many people in town at the moment, seeing it’s going into winter. It’s sorta better in a way that sessions are really small and the parks aren’t really packed! Also the weather is soo perfect to ride in! Filmed a ten clip edit with Ryan at Jaycee park a couple of weeks back which I was pretty stoked to film, been wanting to do one for a while but injuries weren’t letting me. Also Vitamin Water put on a comp at Skatecary which is an hour and a bit away from Greenville. I was fortunate enough to win 1st in the pro section. The park was a lot of fun to ride and it was an awesome day, was stoked. I attached a photo aswell and cant wait to get back to film some more Colony stuff on this new projects Coops has got going on! Talk soon mate – Chris. 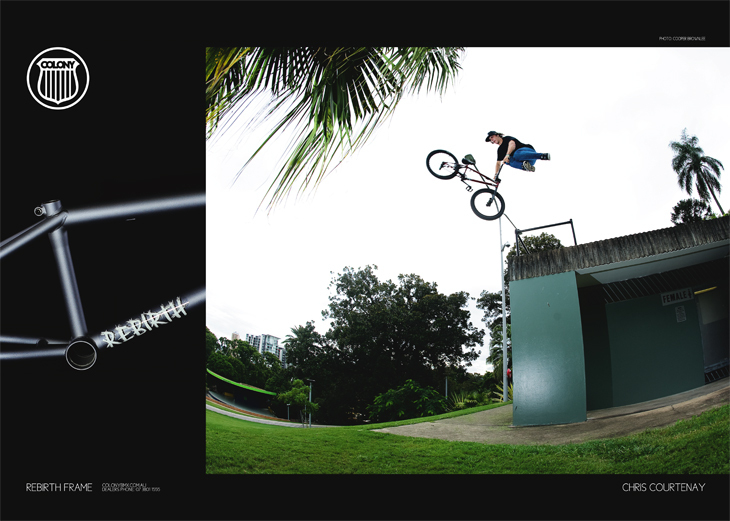 Chris scored the back cover advert in the new issue of Focalpoint, that bank is so steep! 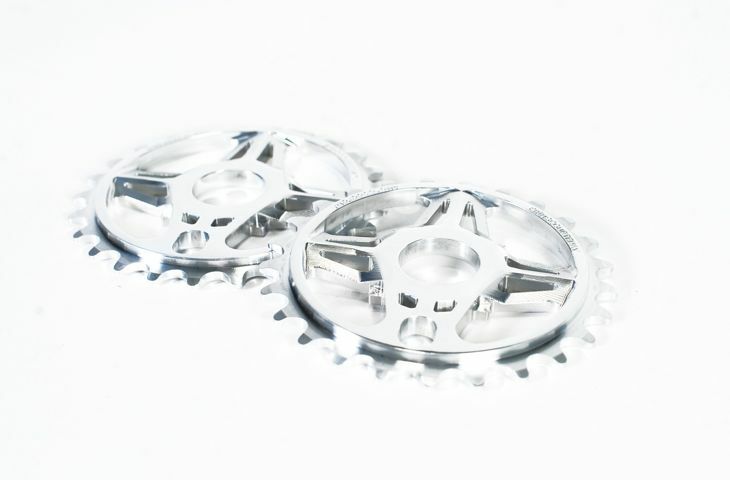 Chris’s signature CC Sprocket will be out in Australia at the end of October & the rest of the world soon after. 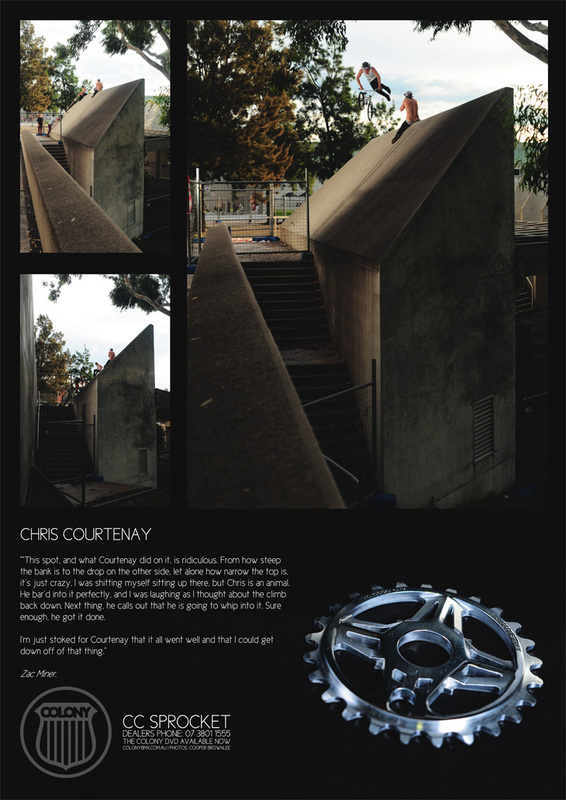 Chris Courtenay is sitting on a plane right now on his way over to Vegas for Interbike & Nora Cup. He will then start off his USA trip for a few months in Greenville & a few other places. During the last few weeks he put some work in for this little edit for Ride On BMX produced by Jack Birtles. Looking really good for sure… well done guys. Marnold, Chris Courtenay and Brock Olive have all recently had Oneclips in the Focalpoint clip a day series. 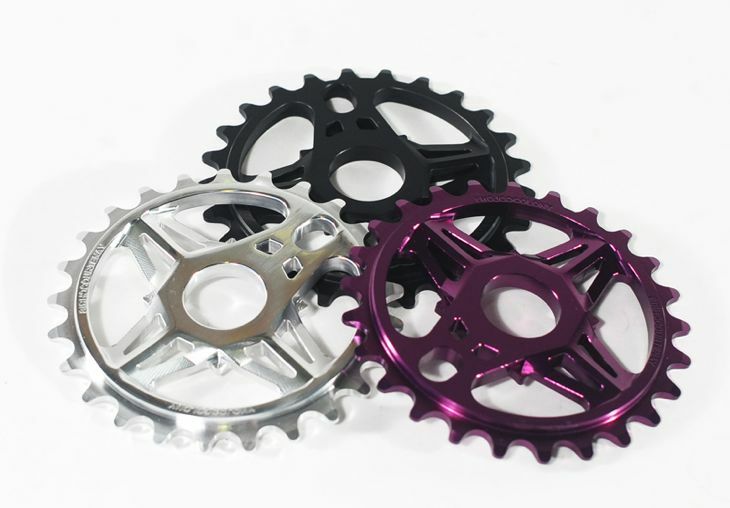 The guys over at Ride BMX did a buyers guide on sprockets & our Official & yet to be released, CC Sprocket are included. Click here now to check them out. 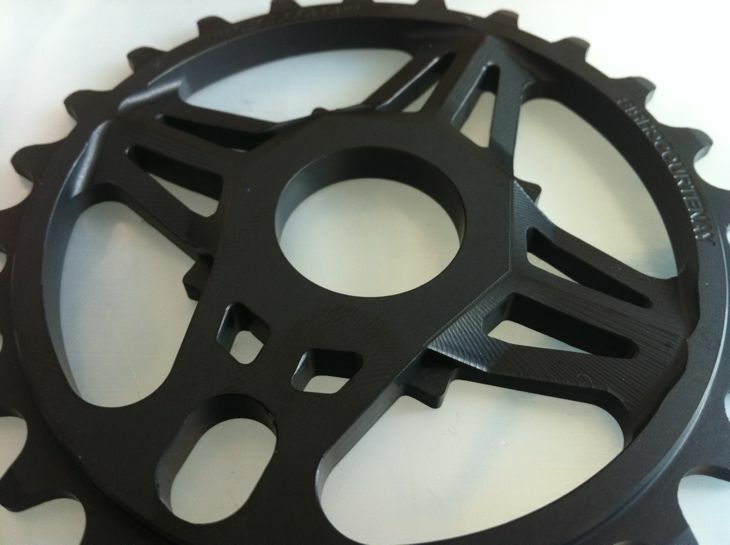 The Chris Courtenay signature CC Sprocket will be out early October. Chris just recently started riding after being off the bike for a couple of months with a broken wrist. He is heading over to the USA next month to hit up a bunch of places. 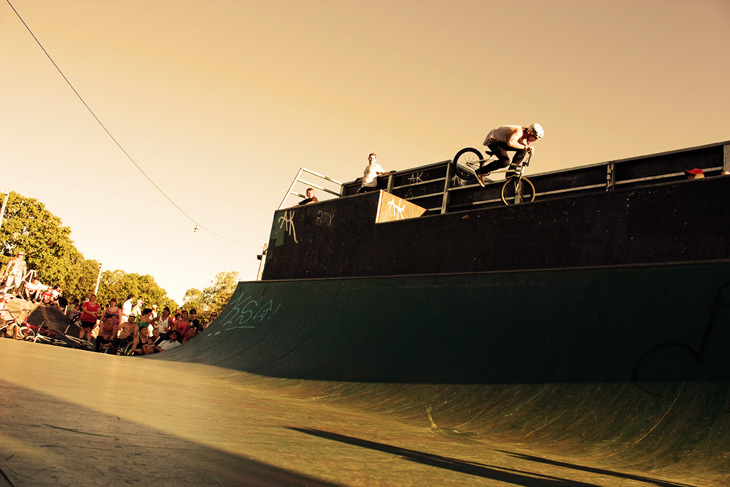 This photo is from an evening ride we had at Woodridge park in Brisbane the other night. 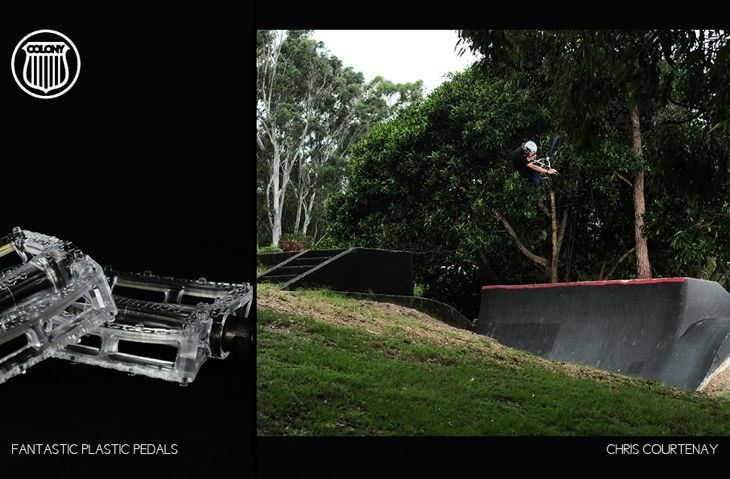 Tom Stretton does a rediculous nose wheelie in this Ride On BMX store advert. Look out for a Chris Courtenay clip in there too. 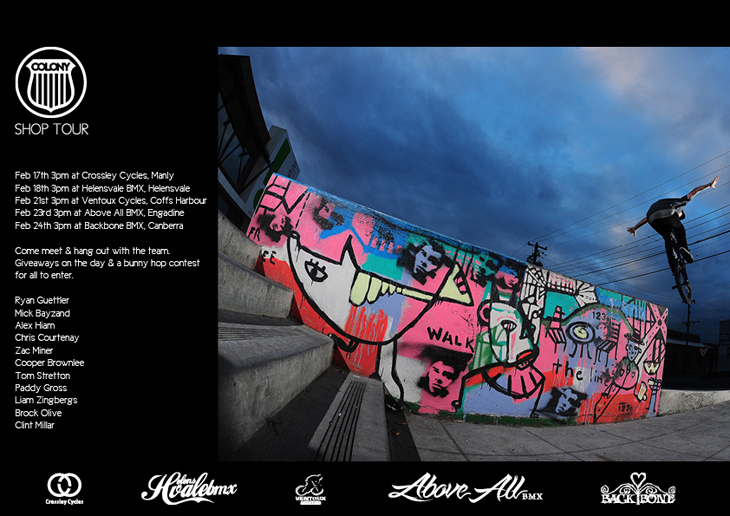 Ride On are good supporters of Colony and the BMX scene so check them out if you are ever in Brisbane. Chris Courtenay had his surgery last week on his wrist & it all went well from the doctors reports. He should be back on the bike in around 12 weeks tops. So expect to see Chris ripping again before you know it. 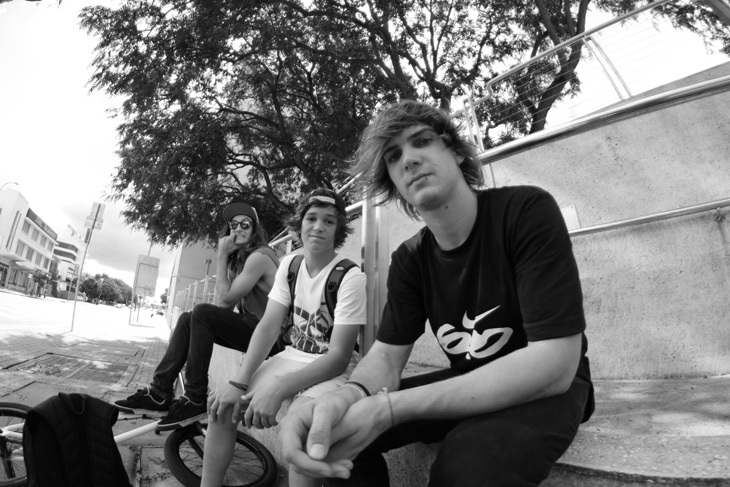 This was taken on a Gold Coast session just this Monday gone… fun times. Chris Courtenay scores our splash page for the next few weeks. The new DVD from 2020 Magazine filmed & edited by Big Salad. Looking the goods & available next month Australia wide. Look out for appearances in the full length feature from a vast bunch of the Colony team when it’s out including Zac Miner, Liam Zingbergs, Chris Courtenay, Marnold, Cooper Brownlee, Brock Olive, Tom Stretton & even myself. Check it. 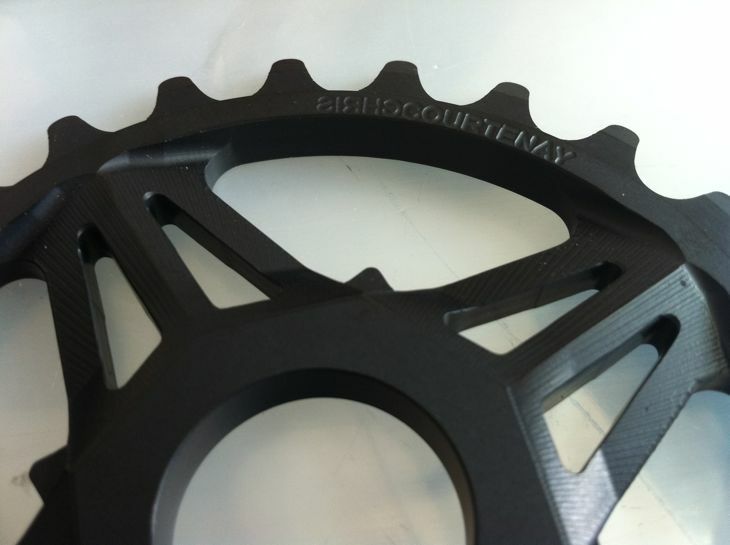 We are gracing Chris Courtenay with his first signature product for the 2012 season. Chris is now testing it & it will be available in August around the planet. 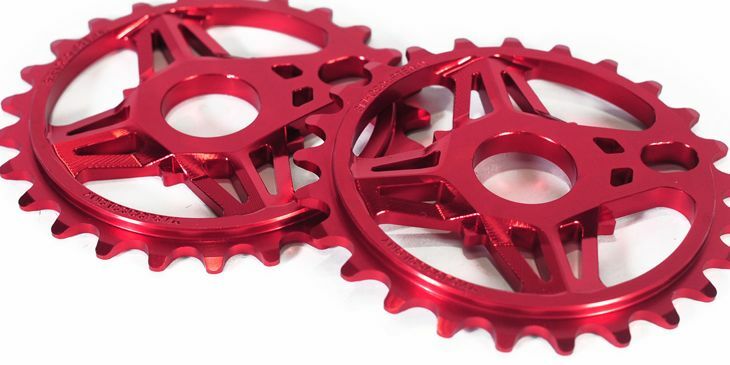 CNC machined from 7075T6 alloy & it will come in Black, Red, Purple, Blue, Gold & Polished. Just in case you missed it…. 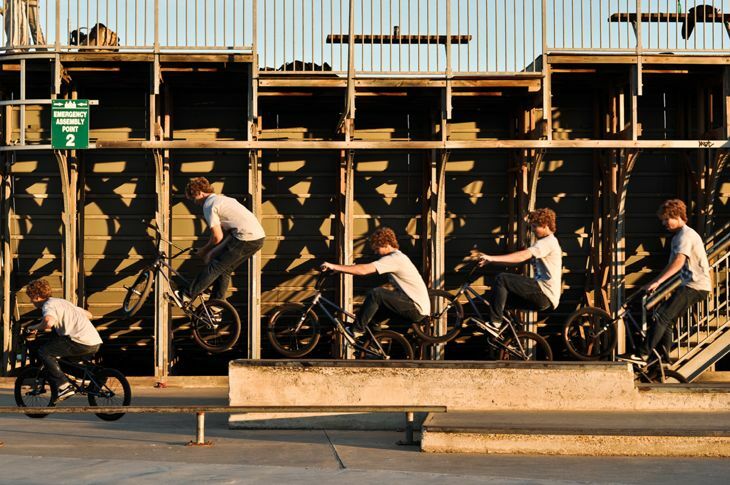 check out Chris’s welcome to the team edit from a year ago. Thanks to Sam Routledge for sending over this photo of Chris he shot at the recent flood jam at Beenleigh park, you can see more of his shots here. 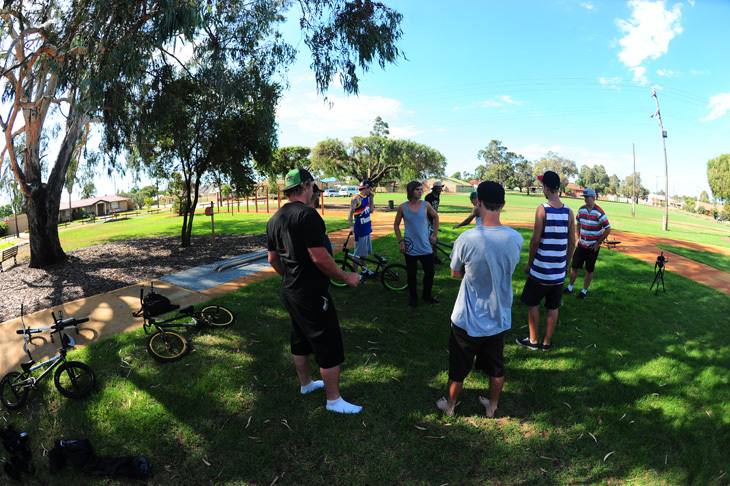 It was crazy hot yesterday in Perth, some of the local crew hooked us up with some fun spots which we had a ball at. We also hit a park which had the biggest spine I have ever seen in my life. Dirtpipe 2011 was unfortunately rain out all weekend and the actual competition was called off. Due too everyone having set flights home, a couple of riders had to cut it short, so Redbull put on a jam to keep everyone psyched. The pipe was rediculous and soo much better and more built up than last year, was soo pumped to leave this year in my own car and not a ambulance! All round good trip and a perfect way to spend a birthday! Later next month, almost the entire team will be meeting up in Brisbane to ride for a few days then head back down south making our way to the BMX Games scheduled for February 25th, 26th & 27th in Canberra. Along the way we will be dropping into some select Colony dealers with a bunch of giveaways, signings & a bunny hop comp open for all to enter. So come along & meet the guys at your favourite shop shown below. This is the most recent advert for us in the current 2020. Monster whip drop to the grass bank by Chris Courtenay. Here is more Chris Courtenay footage, this was filmed and edited by Bret Trigg during a session at Brisbane’e indoor park Ramp Attak for Ride On BMX. 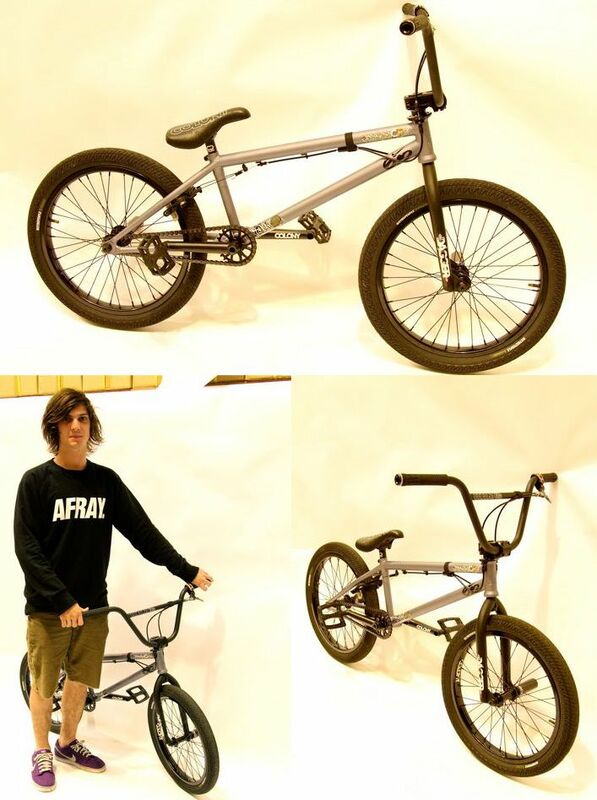 So happy to see Chris riding like he didn’t even have most of this year off the bike. Chris recently started riding again after 7 months off the bike because of a knee reco, whilst in Brisbane a couple weeks ago I caught up with Chris for a few sessions which is where this footage came from along with some questions to see how he is doing. I am up in Brisbane at the moment to help with the new shipment arriving next week. We were out today working on a little project that should be out soon with Chris Courtenay. Keep an eye out for that soooooon. Thanks to Sam Illman for the photo. Chris Courtenay is back on the bike & got together with Drew Raison to make up this little edit… check it out.